A great after-dinner drink for those who want dessert but haven't the space for Christmas pudding. Shake the vodka and the Toussant together and pour into a heavy-based tumbler filled with ice. Gently pour in the double cream over the back of a teaspoon, so the cream sits on top of the drink. 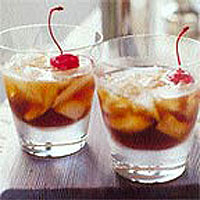 Garnish with a cherry and serve with two short straws.